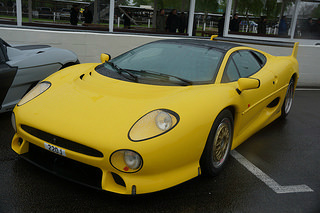 The Xj220 sports car. 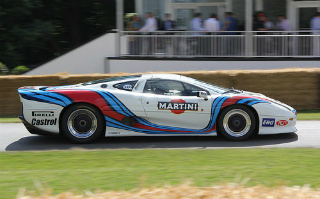 In the late 1980's, it was felt that what was needed was a modern version of the successful C-Type and D-Type Le Mans Jaguar cars of the 1950's and 1960's that could be entered in FIA Group B events. The initial concept was based on a mid-engined, four wheel drive car, powered by a Jaguar V12 XK engine. 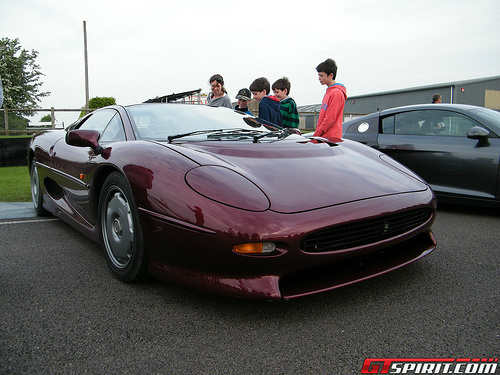 Since it had a projected top speed of 220 mph then, in line with its predecessor the XK120, it was designated the XJ220 Jaguar sports car. In terms of the engine, a 7 litre V12 unit with two overhead cams and four valves per cylinder, it was used in the XJR-9 racer that won at Le Mans. It used dry sump lubrication which helped reduce the car's centre of gravity. Consequently, it was decided to use this engine, but with the capacity reduced to 6.2 litres, and using titanium con rods. This unit had twice the number of valves per cylinder and camshafts as the existing production V12 engine, which made it a good choice for use in a Jaguar sports racer. Since Jaguar had limited expertise in four wheel drive systems, the work was subcontracted to the company that had been instrumental in the design of the system used in the Jensen FF, the first sports car to be fitted with four wheel drive transmission. The styling of the aluminium body was to be based on that used in the D-Type. Although intended to have a road car capability, when set up for racing, the body would produce around 300 pounds of down force at 200 mph, helped by a variable rear wing that folded away at low speeds. It sported electrically operated scissor doors, and a covering that allowed the engine to be viewed. It had leather interior, heated windscreens both front and rear, electrically operated windows and adjustable seats, and air conditioning. It used an aluminium chassis with rear wheel steering, the suspension height was adjustable, and it was fitted with ABS. 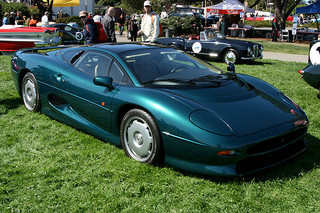 The concept Jaguar sports was launched in 1988 at the British International Motor Show in Birmingham, and was well received, with around 1,500 deposits being placed based on production in mid 1992. 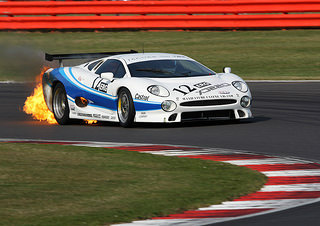 The version put into production was powered by a 3.5 litre, twin Garrett TO3 turbocharged engine, with twin overhead cams plus four valves per cylinder, and linked to two intercoolers and a five speed gearbox. It was, in fact, a specially designed race car unit, designed by Cosworth, and first used in the XJR-10 and XJR-11 racing cars. The original V12 engine was found not to be suitable, on weight and emission considerations. The change of engine meant that the wheelbase could be shortened, with a reduction in weight. The engine had an aluminium head and block, plus steel con rod and crankshaft. Furthermore, it had dry sump lubrication, multi-point fuel injection, and limited slip differential. It developed 540 bhp at 7200 rpm, and 475 ft/lbs of torque at 4500 rpm, which gave it a top speed of 213 mph, and a 0-60 mph time of 3.6 secs. The scissor doors and rear wheel steering were not used in the production variant. It had 13 inch disc brakes at the front and 11.8 inch at the rear, and had no power assisted steering. Production began in 1992, but by 1994, only 275 of these cars had been built, and no more were planned. This was due to market disappointment when the V12 was replaced by a V6 engine, plus the effect of the 1990's recession, which caused many buyers who had placed a deposit deciding not to exercise their option to buy. In terms of sales of classic Jaguar cars, then an example of an XJ220 in good condition could expect to achieve around $170,000, whilst one in excellent condition could fetch as much as $230,000. With only 275 built, there will always be demand for one of these Jaguar cars. A 1992-94 Jaguar XJ220 in very good condition would command in the region of £270,000/$430,000.